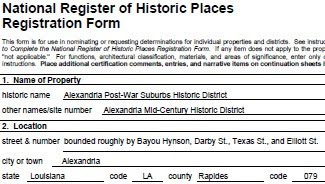 The Alexandria Historic Preservation Commission presents their March 2013 Preservation in Progress award not to a single homeowner, but to an entire neighborhood, the area encompassing the proposed historic district! This is a great honor for the residents of the proposed district. Read about this in the March issue of the CENLA Focus. It's on p. 76 of the issue.